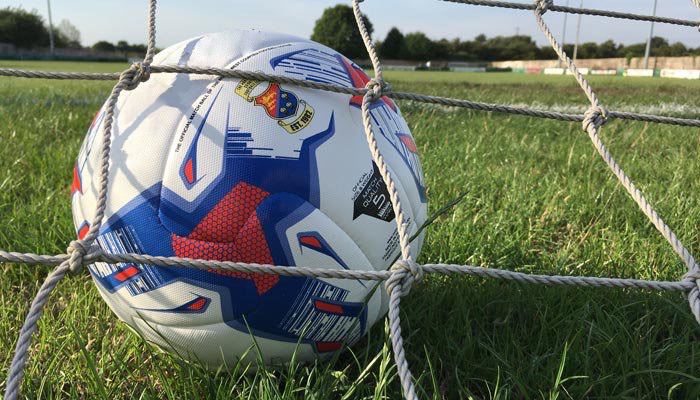 Rylands' made it three wins on the bounce on Tuesday in their first ever Hallmark Security League First Division South fixture under floodlights at Vauxhall Motors. A fast pace was set in the early stages of the contest, with a strong wind blowing and Stuart Wellstead was cautioned by the referee just two minutes in for an off the ball altercation with a Vauxhall midfielder. The hosts looked dangerous early on, putting the Rylands back line under pressure, and Warren Gerrard soon joined Wellstead in the book for a foul out on the blues' right hand side. The blues began to grow in to the game, and saw their first sight on goal in the fifteenth minute when Nevil Picton's pinpoint free kick from deep found the left foot of Gary Kenny at the back post, but the Rylands captain's volleyed effort went wide of the near post. After twenty-one minutes, Tom Croughan broke down the right hand side and found Wellstead in space, but the blues' top scorer's effort was deflected wide by the sliding defender. Rylands survived a couple of scares quickly after, when Gerrard missed the ball trying to make a clearance, but the Vauxhall winger's effort was well saved by Graeme McCall, before the blues' 'keeper was called in to action again two minutes later to make a brilliant save down to his right to deny Ben Holmes after a mazy run inside from the left. The visitors again came in to the game after the half-hour mark, when Elliott Jones found Jay White in behind with a looping ball in behind, but Rylands' number 9 volleyed wide when well placed in the area. Five minutes later, a good team move found its way to Croughan in the area but his effort was turned wide by Leigh between the Vauxhall sticks. Haydn Cooper caused a scare for the travelling Rylands supporters in the forty-fourth minute with a drive from distance, but McCall seemed to have it covered as the ball narrowly evaded the post. Deep in to stoppage time before the interval, Wellstead saw an effort on the turn pushed away by the Vauxhall 'keeper, and White reacted first to fire home in to the empty net to give Rylands the lead with virtually the last kick of the half. The second half began in similar fashion to the first, but a chance didn't come until soon after the hour mark when Croughan's solo run was finished with a low strike from twenty yards that struck the far post and rebounded to safety. The hosts began to push forward, looking for an equaliser but the blues' defence stood firm and limited Vauxhall to efforts from distance and crosses from wide. Rylands could have had a second in the seventy-sixth minute when substitute Tom McNamara broke free inside the box, but the midfielder fired high and wide. The blues next match kicks off at 3PM on Saturday 27th October when the blues host to Barnton in the Hallmark Security League First Division South at Rylands Recreation Club, Gorsey Lane, WA2 7RZ.